On 14 March 2019, Ofgem appointed SSE to take over the customers of Brilliant Energy after it ceased trading. This includes all customers that had signed up with Northumbria Energy, under a ‘white label’ arrangement with Brilliant Energy, before 15 March 2019. The appointment took effect from 15 March 2019. All references to the “new energy supplier” in this article now means SSE. Otherwise the rest of the information in this articles remains unchanged. As soon as SSE has contacted you with details of your new energy tariff we strongly recommend that you do an energy price comparison and, if apprpriate, change to a better and cheaper energy deal. Brilliant Energy has become the 11th domestic energy supplier to go bust since November 2016. This takes the total number of customers affected by energy supplier failures to 984,500 (give or take). One more, and we are over the million mark. You can see the full list here. Brilliant Energy is (shortly to be a was) a domestic gas and electricity supplier. Incorporated on 14 October 2014, Brilliant Energy obtained its electricity supply license from Ofgem on 2 February 2015 and its gas supply license on 9 December 2015. Both licences were granted to Nickel Energy Supply Limited, the company’s previous name. It offered a range of fixed gas and electricity tariffs and renewable energy tariffs. Why did Brilliant Energy go bust? A company becomes insolvent when it does not have enough assets to cover its debts and/or it cannot pay its debts on the due dates. At this stage we don’t know exactly why Brilliant Energy has ceased trading. We’ll know for sure when the administrators / liquidators report is published. Based on accounts filed at Companies House, Brilliant Energy Supply Limited owed long-term creditors almost £1m as at 31 October 2017 backed by assets of less than £500,000. This left a hole of over £500,000 on its balance sheet. The situation is a little more complicated in that there appears to be a number of controlling companies further up the chain. We expect that, for a business that was making reasonably significant losses it just plain ran out of cash and its financial backers were not prepared to stump up any more cash. The fact that HMRC filed a petition to wind up the Company on 13 Sep 2017, subsequently dismissed, might have been an early warning signal. Firstly, the good news. No need to panic, your supply will continue as normal. Ofgem, the energy regulator, will now pick a new energy supplier to take on Brilliant Energy’s customers following a Supplier of Last Resort (SOLR) process. 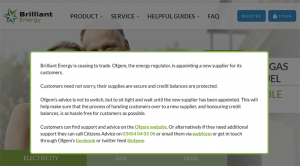 The new energy supplier will be announced on the Ofgem website and will contact affected customers shortly after being appointed to confirm next steps. Brilliant Energy also supplied customers of Northumbria Energy under a white-label (own brand) arrangement. These customers are affected in the same way. Please note that Northumbria Energy is still trading, but cannot currently take on any customers. I’m a Brilliant Energy customer – what should I do? Ofgem’s advise is to stay put for now, until you have heard from the new supplier appointed to take over your energy supply. We would go along with that. You should definitely take a meter reading to ensure you are billed for the correct usage by both Brilliant Energy and the new energy supplier. After that you need to wait a few days for the new energy supplier to be appointed and to contact you. My account with Brilliant Energy is in credit – what should I do? Under the Supplier of Last Resort (SOLR) provisions, customer deposits are protected. This is sometimes also referred to by Ofgem as their “safety net”. The new energy supplier appointed by Ofgem will be responsible for paying back any outstanding credit owed to you. When they contact you, they will explain how this will work. These procedures seem to be working. However, there are also cases where customers have struggled to get their money back in a timely manner. What happens to my old tariff? Your energy supply contract with Brilliant Energy will end and so will your old tariff. The new energy supplier will put you onto a ‘deemed’ contract (this means a contract you haven’t chosen). This contract will last for as long as you choose not to change it. Will my energy bills go up? That depends on the new energy supplier appointed by Ofgem. When appointed they will get in touch and tell you what the new rates are. Although Ofgem has a duty, amongst other things, to try and get you the best possible viable deal during the SoLR process there is nothing to prevent those new energy prices being a little, or even a lot, higher. When should I consider switching energy supplier? Once the new energy supplier has contacted you and you know the details of your new tariff, make sure you do a comparison. Important – you cannot be charged an exit fee for leaving your new deemed contract even if your old energy contract had not yet ended and had an exit fee attached. Your old contract with Brilliant Energy Supply Limited died when they ceased trading. Your new deemed contract cannot come with exit fees attached. If you’d like to know more, we have produced this detailed guide on What to do if your energy supplier goes bust. We hope that covers off just about every scenario we could think of. Enjoy.